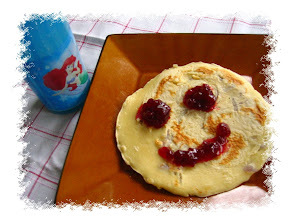 Saturday Morning Breakfasts at our home are usually my husband’s affair, he is in charge, whipping up a warm breakfast different from the toast-omelets or cereal-milk kind. This does not mean that he does not lapse from his routine, after all he is a man , but even if I take 52 Saturday mornings – 12 lapses – 4 traveling Saturdays – 4 Vacation Saturdays, the answer is 32, way better than 42 (!!!). But this Saturday was different, to add a nice twist to the breakfast for WBB#6 Breakfast with a Twist at Nandita’s Saffron Trail, I woke up bright & early and donned the chef’s hat, relegating my hubby to the position of the sous-chef. So I started with the Original Recipe of my Mom. She used to make Dimer Paratha or Egg Paratha which was a breakfast delight in itself and still is a favorite at our home not only for breakfasts but also for evening snacks. I added a twist by making a stuffing of soy chunks for this paratha, which made the paratha look like a wrap or a roll. I also make the stuffing with Keema if I am making this as an evening snack. For my breakfast I prefer the Soya as it is lighter and a more healthy way to start the day with. 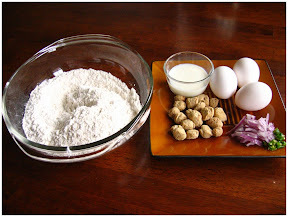 Mix together flour/maida, eggs and milk in a big bowl to make a batter. Stir till smooth. 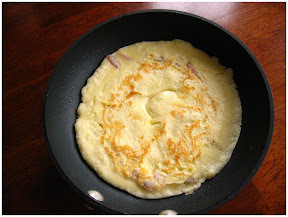 The thickness of the batter should be same as that needed for a pancake or say to make utthapam. Add the chopped onions and chillies, and salt to this batter and mix well. 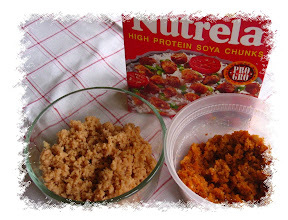 Once they are soft put the chunks in the blender and mince them, so that they look as in the picture (left side). In a frying pan heat Olive Oil. Put this stuffing in the center of the Egg Paratha, add sauce/ketchup, you can also add lettuce, tomato if you want. Roll it and serve hot. Note: Instead of Soy you can use Keema/minced meat. Mix the keema with little yogurt, ginger paste and garlic paste and keep aside for 2/3 hours. Then cook same way as the soy. Trivia: Nutrela soya chunks are made from fully cooked soybean and is a brand name for Textured Vegetable Protein(TVP) ,marketed by RSIL. "Meal Maker" was another brand available in India , I am not sure about it's existence in the present days. you egg paratha looks very nice.but i can't see the pictures.every recipes looks great.keep posting. Cya at the round up! Nice recipe and love that stuffing with soy. Good entry. Sandeepa , yes the Porotha with soy chunks is healthy way to get nourishement and yummy too ,I also liked the Kid version !! Thanks a ton for your nice comments. Could you see the pics ? I think it might be some connection speed problem is it ? That stuffing is sooo useful I tell you. Lovely recipe! It definitely has a twist. Love ur collection of fish recipes too. Every post more mouthwatering than the previous one. that is a very smart recipe i would say. you change the stuffing and you get a whole new dish. this looks delicious sandeepa... will try it soon with soy granules! thanks and do give them a try. hey why no posts. are u busy in UK ? Hey this was absolutely wonderful. Simple, fast, easy & delicious. Unfortunately, i didn't have the hot & sweet ketchup so replaced it with some vinegar, soy sauce & tomato ketchup... needless to say, it came out amazing! I tried the stuffing yesterday with normal parathas and it turned out really well. I have a humble suggestion. Heat very little the moida. Now in a separate pot heat water, the amount of oil needed for making the dough for parata. Use this lukewarm oil+water fto the lukewarm Moida. You shall have a very soft dough. Sandeepa -Awesome!!! How on earth did I miss this? 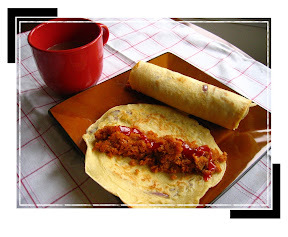 A paratha which doesn need rolling??!! I will try this tomorrow itself. i m loving this...must try my hands at it :) wonderful!